While the market remains positive overall, the price of urea peaked in October in most areas. Producers achieved higher netbacks from government tenders east of Suez and tried to exploit the tighter market in southeast Asia, but elsewhere there was increased reluctance to pay higher prices. Temporary oversupply in Brazil pushed prices down. Buyers saw this as an opportunity to cover most of the requirement for safrinha. Lower than expected prices in the 100,000t tender held in Pakistan on 22 October set the scene for a confusing end of month in the urea market. The winning offer was equivalent to $328- 330/t fob Middle East and this put a large hole in the confidence many felt concerning prices. The paper market dropped $10-15/t in reaction and buyers elsewhere began to reassess. The outlook clouded for November, as the Pakistan sale shaved $10/t off Middle East prices at the high end and saw Egyptian producers accept $335/t fob for November in midweek to stabilize their prices. Sorfert loaded around 105,000t in October and said it was fully committed until mid November. Bids in late October were in the range $335-340/t fob Arzew for November against Sorfert’s target of the high- $340/t fob. Indagro was in the freight market for a vessel to load 25,000t of granular urea in Arzew in combination with 5,000t of phosphates from Annaba 29-31 October for Itaqui and Vila do Conde, Brazil. Producers sold several lots of granular urea for November shipment at $335/t fob, down $5/t. Mopco sold 15,000t to a trader at $335/t fob and OCI 10,000t. OCI also loaded nearly 75,000t of its urea in Adabiya for India and Bangladesh in October and November. Helwan also negotiated sales at that level. Abu Qir offered 25,000t of prilled and 25,000t of granular urea for November shipment, requesting buyers to purchase both grades. Prilled urea was on offer at $306/t fob and granular urea at $330/t fob. Remaining availability from Egypt for November was estimated at about 60-70,000t from producers, plus positions taken by traders. Freight rates have risen sharply in the Mediterranean due to the scarcity of vessels. Rates for small cargos Damietta-Turkey have risen to $15-17/t, while small lots Damietta-French Atlantic have been quoted in the mid-$30s/t. EABC issued signed contracts to suppliers under its 18th September tender for 500,000t of granular urea. The urea was for shipment from October-April in ten 50,000t lots. But it became known that an issue had arisen within Ethiopia and the awards have been frozen, according to suppliers. It was not clear exactly what this means. It was assumed that EABC would eventually open l/cs, but that the shipment schedule, which called for the first cargo to load in late-October, would be put back. Nitron sold 18,000t of Russian prilled urea to a large buyer for October shipment to Abidjan, at a price netting to $304-305/t fob Baltic. The urea was expected to be used for blending. Overall demand from West African markets was low because international urea prices were way above the levels at which local companies took awards in tenders in Mali, Burkina Faso and elsewhere. Suppliers were concerned that the region may see a wave of defaults because of the large losses implied by current urea values. DAP and MAP prices remained stable/slightly soft and liquidity was largely confined to India in the last week of October as the industry gathered for two major conferences. Indian buyers secured more than 180,000t of DAP for November arrival in an unchanged $426-428/t cfr ex-China and Saudi Arabia. Prices were mostly stable. China DAP prices edged down fractionally basis on firmer freight to $410-412/t fob but cfr values in India were steady. Brazil likewise was marginally weaker at $455/t cfr flat basis actual business. Total recorded trades were just over 262,000t DAP/MAP plus 50,000t Saudi product to Bangladesh under government-to-government agreement. In India the high phosphoric acid price had driven more DAP purchases and the November line up was unseasonably high at 500,000t. Two reported deals were completed in Pakistan. Prices were reported around $429-430/t cfr, marginally softer, but the deals were yet to be confirmed. Nepal also issued a purchase tender for 20,000t DAP. West of Suez, Brazilian prices were slightly softer basis one actual spot deal at $455/t cfr ex-Mosaic. High freight took the Tampa DAP/MAP range down to $427/t fob. US DAP/MAP barges fell around $3/t late October but this was partly explained by river logistics issues leading to rushed sales. The lack of l/cs in the Ethiopian tender for 625,000t could be a concern the longer it goes on. But it was highly unlikely that the tender would be cancelled. Some of OCP’s commitment in October included 30,000DAP/MAP to Mali and 35,000NPK 15-15-15 + B to Cote d’Ivoire and Togo. OCP was to ship 160,000t of DAP to Europe, mainly to Spain and France at an unchanged $450- 455/t fob. OCP also sold 70,000t DAP to Europe for November shipment at a roll-over price. Overall November shipments of DAP to Europe were expected to total 130,000t. Foskor’s A sulphuric acid plant was expected to be back in production. This would help Foskor increase production of sulphuric acid and thence phosphoric acid which means supplying more acid to the domestic market and the resumption of phosphoric acid exports from mid- November onwards. Recent tender results have given some clarity on the new levels for MOP in southeast Asia. Although Malaysia still lags Indonesia prices, and Vietnam lags Thailand, standard and granular MOP prices have risen to reflect levels closer to the international market. 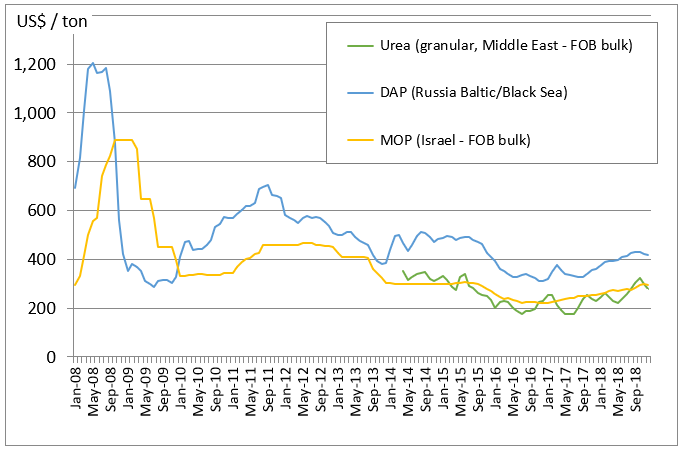 Northwest Europe and Brazil granular MOP prices have risen recently, but have recently been steady. Suppliers expect prices to rise again before the end of the year, as $370/t cfr is the target for Brazil for some producers, and there remains some upside to the European market prices as a result of tight demand. December, and another supplier said it was fully committed on standard MOP until June 2019. Canpotex, Uralkali, SQM and K+S are all tight on product, either regionally or globally. High demand continues to surprise the market, and some suppliers were unable to capitalize on rising prices in some regions because of supply constraints. But those with availability can lift prices easily in parts of southeast Asia, and Brazil and Europe may well see further increases before the end of the year. BPC’s 35,000t of MOP arrived at Jorf Lasfar on 3 October. Prices were not disclosed. November. Granular MOP prices in South Africa were heard to be around $315-325/t cfr. All intellectual property rights in the data and other information published on this page are the exclusive property of Argus, and/or its licensors, and/or IFDC (where applicable) and may only be used under licence. Without limiting the foregoing, by reading this page you agree that you will not copy, reproduce any part of its contents in any form or for any purpose whatsoever without the prior written consent of Argus. All rights reserved. ARGUS, ARGUS MEDIA, the ARGUS LOGO, ARGUS Publication titles and ARGUS index names are trademarks of Argus Media Ltd. Visit www.argusmedia.com/trademarks for more information. IFDC obtains data from Argus Media under licence, from which data IFDC conducts and publishes its own calculations set out in the tables and graphs on this website. Argus makes no warranties, express or implied, as to the accuracy, adequacy, timeliness, or completeness of its data or IFDC’s calculations, or fitness for any particular purpose. Argus shall not be liable for any loss or damage arising from any party’s reliance on Argus’ data or IFDC’s calculations, whether published on this page or otherwise, and disclaims any and all liability related to or arising out of use of the data and/or calculations to the full extent permissible by law.